A Biography In His Own Words. This spiritual treasure is taken entirely from the recorded Satsangs and writings of Swami Amar Jyoti, including many rare Satsangs that have never been released, and intimate gatherings with devotees in America over four decades. Among the eighteen chapters are two chapters of devotees’ remembrances from India and the United States. 32 pages of color and black and white photographs of Gurudeva taken from 1960 through 2000 make this the most remarkable book on His life and teachings. HARDCOVER EDITION: Japanese silken paper and cloth hardcover, gold stamp embossing on cover and spine, smythe sewn with ribbon marker and full color dust jacket. Size: 6 3/4” x 9 1/2”, 492 pages, color frontispiece and 32 pages of color and black and white photographs, $34.95 plus shipping. LIMITED SLIPCASE EDITION: The hardbound edition above, including frontispiece and 32 pages of photographs with a matching cloth-covered slipcase in place of the dust jacket. Slipcase inset with a full color photograph of Swami Amar Jyoti with His blessings and signature gold embossed, $44.95 plus s/h. The Limited Slipcase Edition is being offered at cost to make it affordable for everyone wishing to have it. “The true purpose of all education,” says Swami Amar Jyoti, “is actually to dispel darkness.” With penetrating clarity, playful humor and sublime intelligence, Immortal Light banishes illusion and replaces ignorance with understanding. The editor of this exquisite biography has preserved the charming nuances and brilliant insightfulness of her Gurudeva’s teachings, inviting the reader into a profound intimacy with one of the great spiritual masters of our age. like many Indian sages, Swami Amar Jyoti deeply understood the Judeo-Christian traditions and distills the essence of universal wisdom from all religions with easy grace. This book should take its rightful place among such spiritual classics as Autobiography of a Yogi, The Gospel of Sri Ramakrishnaand Miracle of Love. I will be giving it to my students and friends for years to come. Swami Amar Jyoti was one of the main gurus who brought the real knowledge of Yoga and Vedanta to the West. He was notable for his gentleness, kindness, breadth of vision and quiet but profound manner… never running after mere outer appearances. Swami had a special humility that saw God in each creature and sought to help each person discover God in their own way. 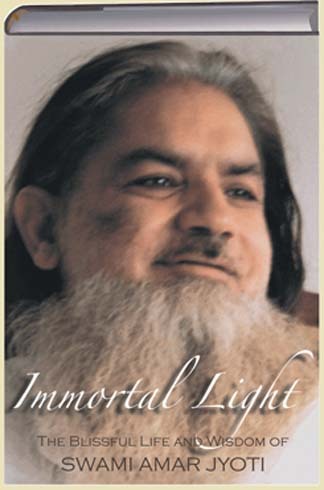 Immortal Light is a rare biography, almost an autobiography, gathered from the words of the sage, taking the essence of what he said in over thirty years of a many-sided teaching that encompassed all of life. It is an important document for Yoga in America, revealing to us the deeper side of this profound tradition which synthesizes, embraces and transforms into its highest urge all the spiritual aspiration of humanity, known and unknown. The book is a welcome breath of fresh air from the high mountains, an articulation of the spiritual heart in an era all too often dominated by more mundane compulsions. It is bound to greatly inspire every sincere reader. Immortal Light rings with sheer revelation. It’s an intensely profound and rare account of one soul’s journey to God. Swami Amar Jyoti beckons us to join him in the realization of our oneness with God. This is the new birth he promises as we rise from the sensual and into God’s spiritual kingdom of love and compassion. This book comes at a propitious time when the world needs desperately to hear such a message. 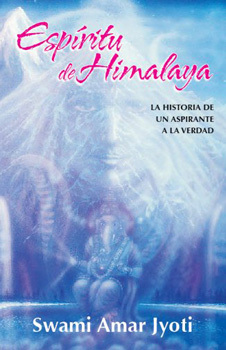 This book is a collection of words and talks given by Swami Amar Jyoti at different times in his life. He speaks with absolute humility and describes what begins as an ordinary life. This makes his message easily accessible, even if you don’t know all the traditions and words. He uses humor to explain much and tells of his life and the divine. The idea that realization is available for everyone is appealing; you don t have to follow a certain road or know you were meant to be a prophet from birth. Divinity is miraculous, once we get out of the way of it. This book takes a world as one view and weaves together the great sages as an expression of the one great power. I don’t think you often find a discussion of Krishna, Jesus and how to get the cat next door off your favorite chair all in the same book! When a detailed account of the life and teachings of a guru is written by a devoted disciple, the compassion and wisdom of the guru is more likely to be transmitted to the reader—as it is in Immortal Light. Swami Amar Jyoti’s spirit continues to brightly shine and bless. ~ Dr. Roy Eugene Davis, Director, Center for Spiritual Awareness, author, A Master Guide to Meditation and Seven Lessons in Conscious Living.